Hand Tossed Italian Style. 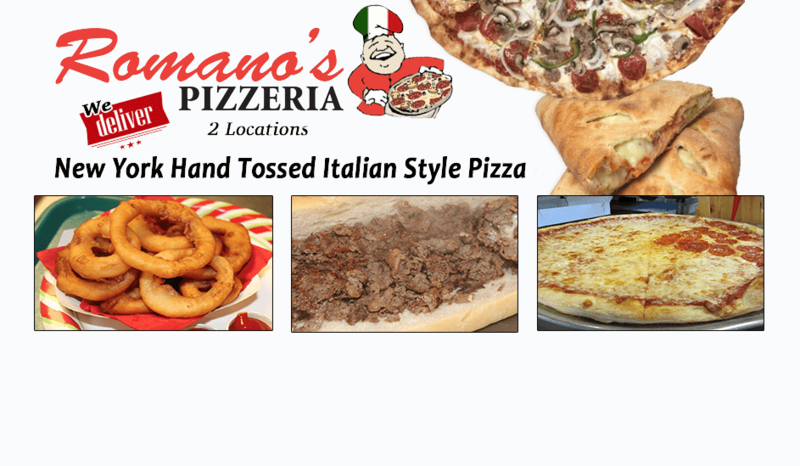 Our dough is homemade and hand tossed then topped with homemade sauce and the finest cheese. Baked right on the stone for you! TOPPINGS: Pepperoni, Sausage, Bacon, Ham, Anchovies, Salami, Meatball, Feta, Broccoli, Mushrooms, Spinach, Eggplant, Green Peppers, Tomatoes, Onions, Black Olives, Pineapple, Garlic, Jalapeños, Banana Peppers, Roasted Peppers, *Extra Cheese *Chicken Fingers, *Grilled Chicken. *COUNT AS TWO TOPPINGS. Sausage, Ham, Pepperoni, Meatballs, Bacon, Mozzarella Cheese, & Pizza Sauce!!! Fresh Mushrooms, Fresh Green Peppers, Fresh Onions, Black Olives, Fresh Steamed Broccoli, Fresh Sliced Tomato, Mozzarella Cheese, & Pizza Sauce!!! Pepperoni, Sausage, Meatballs, Fresh Green Peppers, Fresh Onions, Fresh Mushrooms, Mozzarella Cheese, & Pizza Sauce!!! Fresh Grilled Chicken, Fresh Steamed Broccoli, Mozzarella Cheese, & Delicious Creamy Alfredo sauce!!! Delicious Fresh Homemade Chicken Cutlets Breaded Fresh To Order, Mozzarella cheese, & Our Amazing Pizza Sauce!!! Fresh Marinated Grilled Chicken, Roasted Peppers, Fresh Sliced Tomatoes, Mozzarella Cheese, & Pizza Sauce!!! Fresh Homemade Chicken Fingers, Buffalo Sauce, Mozzarella Cheese, & Side Of Bleu Cheese Dressing!!! Fresh Marinated Grilled Chicken, Fresh Red Onions, Mozzarella Cheese, & BBQ Sauce!!! Fresh Grilled Chicken, Ham, Mozzarella Cheese, & Homemade Garlic Butter Sauce!!! Bacon, Fresh Sliced Tomatoes, Mozzarella Cheese, & Delicious Creamy Alfredo Sauce!!! Delicious Extra Lean Shaved Steak, Fresh Grilled Peppers, Fresh Grilled Onions, Salami, & Mozzarella Cheese!!! Delicious Extra Lean Shaved Steak & Mozzarella Cheese!!! Classic Italian Meats Mortadella, Salami, Hot Capicola, Mozzarella Cheese, & Pizza Sauce!!! Ham, Pineapple, Mozzarella Cheese, & Pizza Sauce!!! Fresh Spinach, Feta Cheese, Fresh Sliced Tomatoes, Black Olives, Minced Garlic, Mozzarella Cheese, & Pizza Sauce!!! Fresh Spinach, Fresh Mushrooms, Homemade Garlic Butter Sauce, & Mozzarella Cheese!!! 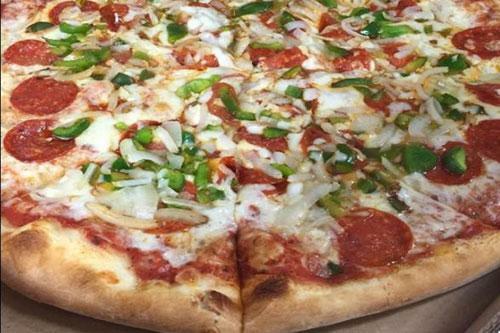 Fresh Green Peppers, Fresh Sliced Mushrooms, Onions, Mozzarella Cheese, & Pizza Sauce!! !